This is the final installment (I think) in my modest proposal. There are lots of specific proposals that I could make (about outreach, use of new media, and more) but they are really outside the scope of this series, which was to paint some big ideas with fairly broad strokes and to invoke the art critic in people who care about the future of the Friends message and get them to respond. So, to that end, one more probably improbable proposal. Let's change our name. YIKES!!! He can't be serious??? Ah, but he is. While I dearly love "Religious Society of Friends" and am even proud to be a humble Quaker, I'm not sure that either really help us share our message. I'll concede to keeping "Quaker." It has a homey, friendly appeal -- thanks in no small part to a certain breakfast cereal conglomerate and a nostalgic view that folks outside our Society have when they hear that word. But Religious Society of Friends says ... um... nothing to people outside of our little group. So let's dump it in favor of some simpler, more descriptive phrase. How about "Friends of Jesus?" Well, as I recall, we took the name Friends because a certain Biblical figure uttered some words that we liked -- "Ye are my friends, if ye do whatsoever I command you. Henceforth I call you not servants; for the servant knoweth not what his lord doeth: but I have called you friends; for all things that I have heard of my Father I have made known unto you." (John 15:14 & 15, KJV). And who was the Biblical personage who uttered those words? Hmmm ... Jesus! Now, before I am accused of being totally ignorant of the breadth of Friends theological thinking and language and some Friends dislike of the name (if not the person) of Jesus, I know that this will stick in some Quaker craws. It does in mine just a bit -- especially during those times that Jesus words bug me. And I'm pretty sure some members of my family won't like it. But, it does get back to the intent behind the early Friends calling themselves Friends. They were -- or at least hoped to be -- the friends of Jesus. Think of how it would simplify how we identify ourselves to outsiders -- or those we hope to attract? What would it be like to invite someone to visit the Friends of Jesus in Plainfield instead of Plainfield Friends Church? Or Plainville Friends of Jesus instead of Plainville Friends Meeting? Sounds sort of fresh and new and Biblical and ... um... George Fox-y, doesn't it? I think it could have a special appeal to those folks who say they like Jesus and his message, but just aren't too sure about the church. Of course, changing the name will not make any difference if the Friends of Jesus are just the same old church/meeting dressed up in a new moniker. But the name itself is an invitation -- and a challenge. Do we wish to live up to the potential of the original intent of our name? Do we, individually and corporately, want to be the friends of Jesus? To live and move and have our being in the same Spirit that inspired the women and men who founded our movement? To do whatsoever God commands us? To live our faith daily within a community of belief and seeking God, held in a soulful tension of learning and growing? Ah, it's only a name. Boy oh Boy, it is ever going to be fun to talk with folks about this at the conference at Quaker Hill. I hope a whole bunch of different Quakers come and we can really talk and listen. That would be fun... let's hope folks sign up! I doubt if those who are devoted to "Friends church" will be interested, and as a settled denizen of a Friends Meeting I like our name. Indeed, in my experience the chances to explain our names ("Meeting" vs. church, Monthly, Yearly, etc.) have been the basis for many fruitful theological discussions and, yes, evangelism (there's a word that doesn't scare me). The name segues right into some of the issues that make the RSOF different, and that MAKE a difference, at least to me. BTW I don't think my attachment to the traditional name reflects any antipathy to Jesus. Yeah, the RSOF I identify with is theologically diverse, but its inclusiveness definitely extends to the Man in the Gospels. (And the Gospels too.) Sometimes it's appropriate to remind some of my more "liberal" Friends about that; comes with the territory. 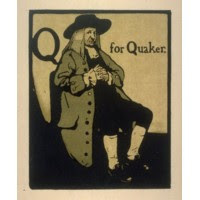 And while "Quaker" gets a pass here, let me point out that Friends not only retained the term, we transformed it from an insulting pejorative into a badge of (humble) honor. I don't think RSOF needs such rehabilitation; but explanation is not a burden but an opportunity. Sorry, it ain't broke, so I'm not for "fixing" it. Ah, depends on a definition of "not broke," I guess. Just because it works of us internally or feels comfortable doesn't mean it ain't broke. And I will stay that I'm not appealing or writing this for folks who are "interested" -- I've been writing this for those who are hungry for a revitlization of the Quaker message -- to get things out of the way that might inhibit that. Could I be comfortable and cozy within the Religious Society of Friends and find some Meeting that meets most of my needs. Sure. Is that what I should be doing? Is that what WE should be doing? I wonder. If it is, then the RSOF itself will become an anachronism -- an interesting group to look at as in a museum or as "Still Forms on Foxfield" (a sci-fi novel by Quaker Joan Slonczewski for those who don't know). So, regardless of whether it's a non-starter or not, I still think it's worth thinking about. Not because I like our name or not... but whether I think it invites us to mission and others to experience the Everliving Christ. I Know that 'in the United States' is part of your title, but I hope that a comment from a UK Quaker will not be out of place. My experience is that people often have misconceptions of the word 'Quaker' (one of my favourite words, by the way),but 'Friends' is less loaded. 'Friend's of Jesus' would do little to entice people in this country when UK church membership, in general, has fallen to an all-time low. Perhaps we should stick to 'Friend's Meeting House' or perhaps drop the last part of the title and just have the word 'Friends' above the door. Ah, Tonda is a Young Adult Friend (aka "anonymous" in a comment in this string) who tends to enjoy tweaking me! Didn't another group already use Friends of Jesus in the 70s? I think that our name is the least of our problems. When we actually "live and move and have our being in the same Spirit that inspired the women and men who founded our movement," we can worry about the name of our movement. When we earn a new name, it will arise. Actually, Robin and Chuck, I agree with both of you. I don't like the name Friends of Jesus at all -- it seems too restrictive and too loose at the same time. This post was meant to be hyperbolic and over the top -- to get people to at least think/react to what we ought to keep and what we ought to discard. And what could be much more hyperbolic than proposing a name change that is not needed -- a mark of absurdity! Changing names would be, to me, a bit like rearranging deck chairs on the Titanic --an exercise that makes you feel like you're doing something, but really doesn't make a darn bit of difference. And it seems to me that we do plenty of that when we are concerned with keeping the institution of Quakerism alive instead of promoting the Friendly gospel message. It was my hope, by putting it last (as a proposal), it would be so outrageous that people would say, well, he's over the top there, but some of the others are worth thinking about. And those important one are those addressing worship, leadership, etc. But hey, I like the new design of your blog. One the one hand, it's less important even than the name, but on the other hand, designs & names do make a difference. Brent, I liked that you were even willing to suggest a name change, even if it's mostly just to be hyperbolic. It's funny how many sacred cows are laying around, especially for a church that disavows sacred cows. I tossed the idea around and wondered what it would be like to be "Camas Friends of Jesus." I actually like it because Jesus to me is a radical, revolutionary figure. But then I remembered reading some Tolstoy (I think?) or something where the "Friends of Jesus" were actually more of a cult so that began to conjure up something else...ha! And I agree with Robin, design and aesthetic actually does matter today, even if we don't want it to matter. Our meeting house (at least on the outside) is in disarray and I know from experience that it can be a turn off for people wanting to visit. People need something and someone warm and inviting. But maybe instead of a name change, we should have a name swap. Programmed Friends can take on the name Quaker to remind us that we are a peculiar people with a tradition, and our unprogrammed brothers and sisters can take on "Friends" to remind them that they are a part of the church and the lineage of Jesus Christ. (And BTW I know that there's already lots of convergence with the useage of these terms). I'm suggesting this mostly because I really get annoyed when people say "Friends Churches" are this and "Quaker Meetings" are this. That is a false dichotomy that should not exist and could use some deconstructing in my opinion. they just sounded too radical. Church of the Inner Light? Either of these names would mean aome-thing real, to both insiders and outsiders. Can we change at all? I am a Friend and a Friend, and then a FRIEND. My relationship with my Lord thrives in the RSf, and the Light burns ever so bright. Each Friend has the Inward Light burning, to some degree--and THAT is what people see, and are searching for . The name is secondary. I like the name. I think it speaks volumes. Ah, Simon Marc, you must have missed the comment where I said this was a bit of hyperbole -- connected with the title, "A Modest Proposal." Though I disagree that the rationale (even in it is extremism) is what "put pastors and pulpits" in Meetings. That was a whole 'nother set of thinking centering around the sweeping revivalist/holiness movement. I like the idea of "Seekers of Truth." (Sounds vaguely familiar as the name of a blog ;-? ) As Chuck alluded to, it would mean the opening to discuss "Truth, Justice and the American Way" or would that be "I am the Way, Truth and Life." I am not a Friend, but am a direct descendant of Friends who settled in Bucks PA in the early 1600's. I left the denominational churches looking for a less religious, simpler fellowship based on relationship. I am looking for relationship with Jesus and relationship with others. At this time I am researching RSOF and have found that we have much in common. It is interesting that the name includes "Religious" because that seems to be the last thing most Friends are, if you were to change anything, drop the "Religious" part. Being friends of Jesus and friends of your neighbors is who you have been for hundreds of years, and that identity translates quite well in the 21st Century. Your name should be the least of your concerns. People on the outside will not respond to some slick PR campaign or come rushing in because of a "New and Improved" banner hung over the door. The simple message and history of Friends is what you need to work on getting across. As a new seeker, it was the name Friends that intriqued me into looking! Friends meeting. How wonderful does that sound? Comes off the tongue just right too. All my Catholic friends don't realize I am straying because I am going to a Friends Meeting. They say "Have fun!" LOL. @ Anonymous -- welcome, Friend!